Pacific Union real estate professional Dana Green (center) and her sisters Jill Montiquila (left) and Wendy McClain (right). Pacific Union is proud to share the news that Contra Costa County real estate professional Dana Green has been named Lafayette’s 2018 Business Person of the Year. The Lafayette Chamber of Commerce honored Green at a reception on Friday, Feb. 2 at the Lafayette Park Hotel & Spa. During the event, Mayor Don Tatzin gave a State of the City address, and Lafayette introduced its 2018 Board of Directors. A Lafayette native, Green has been the No. 1 real estate professional by sales volume in the city for nine consecutive years, as well as No. 1 in Contra Costa County for seven straight years. 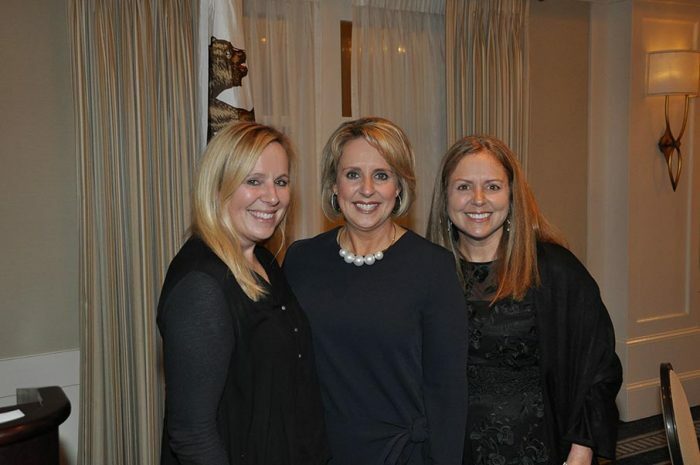 She has received recognition for her performance by publications such as The Wall Street Journal and San Francisco Magazine but says that being named Lafayette’s Business Person of the Year is a particularly special acknowledgement. Pacific Union CEO Mark A. McLaughlin is equally supportive of Green’s achievements and efforts. In addition to her impressive real estate track record, Green is active in many local community organizations, including Lafayette Library and Learning Center, UCSF Benioff Children’s Hospital Oakland, the Lafayette Chamber of Commerce, Lafayette Juniors, and Lafayette Partners in Education. Last fall, Dana and her team sponsored a Grateful Gatherings event, in which they distributed household goods to families transitioning out of poverty or homelessness, and she also co-sponsors Lafayette’s annual December “Its a Wonderful Life” holiday kick-off event.